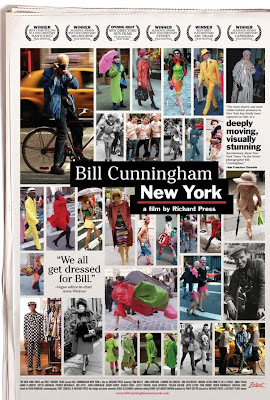 The movie Bill Cunningham New York opened yesterday and in advance of my review of the film, which I hope to see this weekend, I thought I’d write about Bill, a man I find so inspiring. 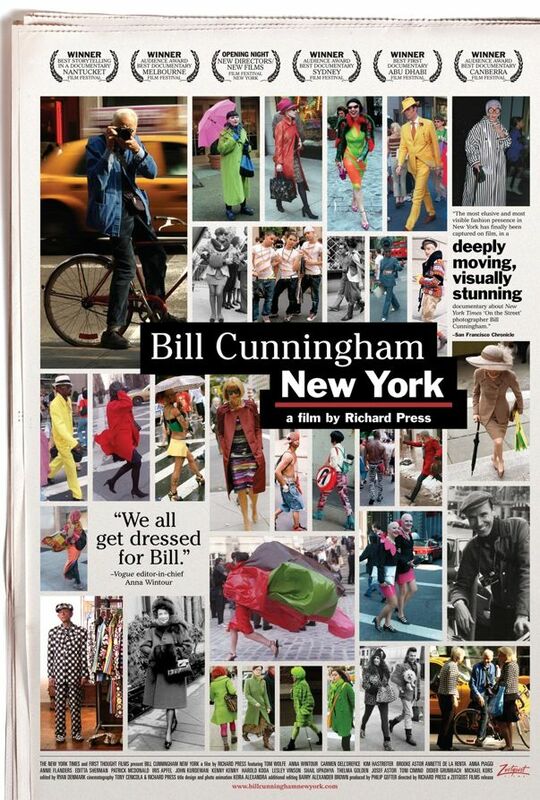 Bill Cunningham is the 82-year-old street fashion photographer for The New York Times who rides a bicycle to get around the city and always wears a blue smock since their deep pockets allow him to put film rolls inside. I had it from an acquaintance, a photo editor at The New York Times, that he and the other editors have tried to get Bill to not ride around on the bike, since he’s wrecked more than one, even been hit by a city bus (! ), but all to no avail. To the bike he remains true. My friend also mentioned that something else Bill is true to is film, he does not take digital photographs. I’ve enjoyed Bill’s photos for longer than I knew who he was, but it is his narration in “On the Street,” the weekly roundup of pictures he took and him talking about what fashion he is noticing on everyday people that made me a huge fan of him and his work. I love his Bostonian accent, “It’s mah-velous!” and his tendency to call anyone younger than himself “child,” or “young fellow,” often referring to people in their 50’s or 60’s. I just love that. I also adore his joy in clothes, which is so evident in what and who he shoots. 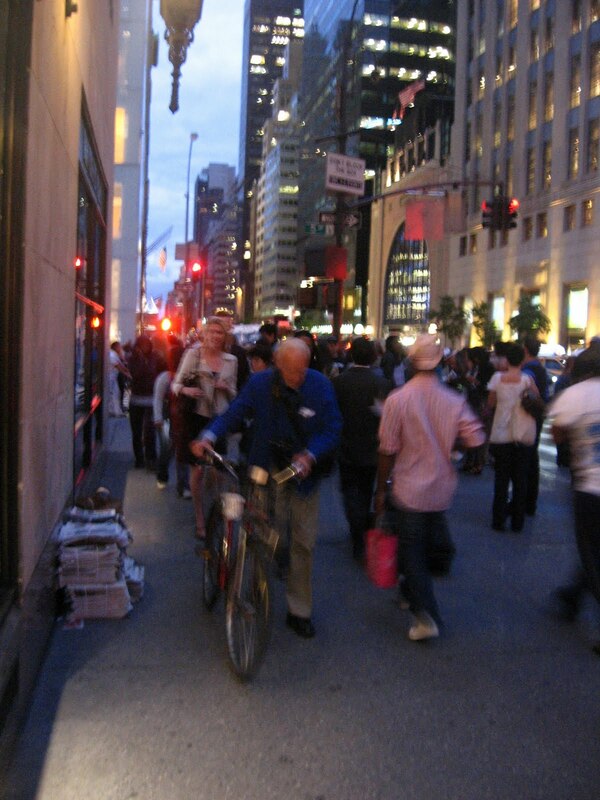 I had goosebumps on Fashion’s Night Out last September, standing outside Bergdorf Goodman’s in Manhattan, at 57th Street and Fifth Avenue, waiting for a friend, when I saw Bill Cunningham slowly walking his bike up the street toward me, camera around his neck. He was taking in the sea of very well (and expensively) dressed humanity all around us, just like me. 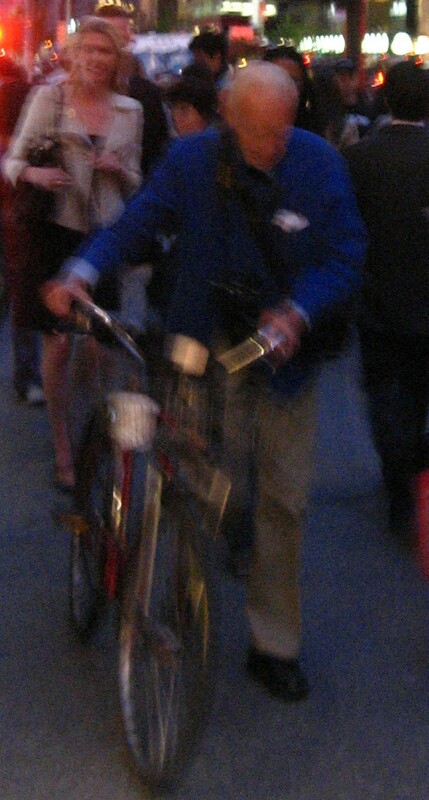 I have lived in New York City for over 14 years but I can still have moments of “Pinch me, I’m in New York,” and seeing Bill Cunningham at work was one of them. Bill Cunningham, September 10, 2010, New York City. Interestingly, he was looking, but he wasn’t taking pictures. He was considering everything, everyone. I could feel it again when I saw him thirty minutes later, on the other side of Bergdorf’s (by this time I was waiting in a very long line to get in the store). He was observing, but he wasn’t shooting, which tells me he is very selective about when, and for what, he brings his camera to his eye. I can’t wait to learn more about the man and his methods in the new film. I think he has a lot to teach me, and everyone, about passion, longevity, and being true to yourself. Oh I would so love to see this film (I had a post lined up about it!) - I love his series on street fashion - its what led me to fashion blogs - and his passion for fashion. I hope it comes to London. How amazing you caught him on the street! I love this story!! I was not familiar with Bill Cunningham and now I would love to see this film...I hope it comes to this part of the country. Thanks for educating those of us down under...who may not get to experience so much from NYC!! I fell in love with him as soon as I saw what he was about. In his own words: If you don´t take money, they cannot tell you what to do.A true free spirit after my own heart. How lucky of you to have seen him in full fly, my dear Jill. A fantastic celebration of Bill Cunningham! And I'm overjoyed he still uses all film. Overjoyed. Little wonder, now, why he isn't just snapping away like all the digital folks. Fascinating! I wasn't familiar with Bill Cunningham, although I suppose I may have seen his work during the year my husband and I subscribed to the weekend editions of the NYT. This definitely sounds like a movie I want to see, and I have a feeling I'll be looking for an archive of his images. Bless his heart for having such a selective eye and shooting to film. I was lucky enough to meet him at Paris Fashion Week! I also noticed the way that he really takes time to select the people that he photographs. I didn't know that there was a movie, so thank you for posting this! I am now looking forward to seeing it! I'm wondering how long it will take for this film to make its way to KC...patience. Hope it gets to VA, maybe the Naro will screen it. I still remember years back when we watched all the different clips of him on the computer and enjoyed his comments and pictures. Great times...great memories!!! I'm glad he's still hard at work in the city. Great post, my dear!Love you. Hi Veshoevius, I hope you still write about Bill. I never get tired of hearing about him. I know he inspired me to start my blog and I bet there are a ton of others who started because of him too. Hi Pam, I'm so glad to introduce you to Bill Cunningham's work. I think you will love him too, he's so inspiring and still at work at 82! Hi Aesthetic Alterations, thanks for stopping by my blog! And I'm coming back to yours. You had me at Hermes! As for Bill, he is completely true to film, it was unbelievable to watch in the film. No digital photos for him. Hi Sarah, if you and your husband got the NYT weekend edition for a year, you have seen Bill's work for sure. He's got a roundup of what he liked during Paris fashion week in today's edition (March 20). Hello Glimpse Creations (it's Sarah in Paris, right? ), thank you for stopping by, thank you for following! I cannot BELIEVE you got to meet Bill at Paris fashion week, that is so great and I'm sure I'm jealous! I think you will really love this movie. The crew followed him to Paris, which was just great. He said it was necessary to return to Paris "to educate the eye." Oh Sacramento, you love the same things about him that I do. I love that you know that quote of his about If you don't take money they can't tell you what to do. I'm thinking of seeing if I can find him again at 57th and 5th in the city. I know those are his stomping grounds. I wish you were here so we could go together. Hi Terri, I think the movie is only playing in NYC right now and then only in ONE theater! I hope it goes in wider release soon. Hi Mom, yeah, those were good times, watching the 'On the Street' pictures with Bill's audio. He says in the movie that it takes about five minutes to tape those sessions. All the real work is in putting together the photos in the exact way that he wants them. Good ol' Bill!